If you need any assistance, you can leave a comment over on the dedicated page for the Tweet WordPress plugin for Twitter. If you like the plugin, I’m happy to accept donations if that’s your thing. I’ve just cloned this blog to a development version on my Macbook Pro. The Mac has Apache2 installed by default, so I just had to get mysql working. Downloading MySQL and installing on Leopard is a breeze with the native package. Welcome to the MySQL monitor. Commands end with ; or \g. Google provides an answer, with a log lived post from My Macinations providing the solution. It’s all to do with correcting your php.ini with the proper MySQL socket location. Now, back to testing my new version of the Twitter Tags wordpress plugin. #hashtags now work! Now that I am using wordpress 2.7, I thought it would be good to test the iPhone app for wordpress. This is written on the app itself. I would say that although useful it seems to be more favorable to blog from a computer. The iPhone is suited to short spurts of typing, more on the realms of SMS or twitter. 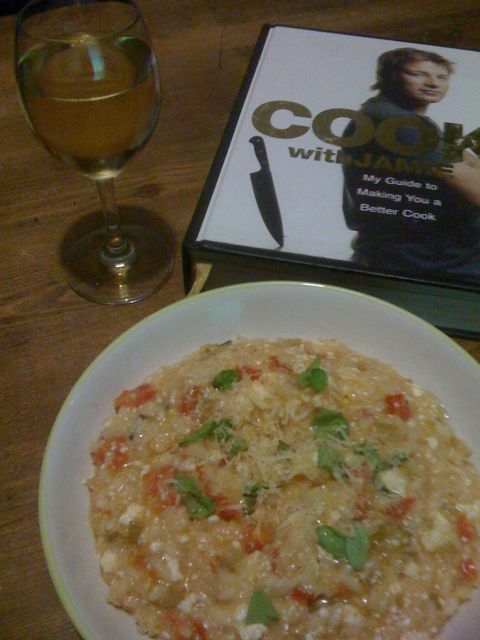 The capability of quickly adding photos and the tag/category functionality seems full featured, as shown by a photo of my dinner I made from Cook with Jamie. The app did crash when I tried to load this post from a local draft – it looks like the iPhone app needs a bit more work. Blogging from the iPhone? 6 out of 10 points. I’m lagging so far behind on wordpress that I’m probably breaking all the security rules. So in an effort to be more proactive in online open-source communities I’m giving WordPress V2.7 Release Candidate 1 a whirl. Looking forward to the new Admin UI. Does anyone else ride the bleeding edge when it comes to tech blogging? Edit: The upgrade worked. 2.7 RC1 even worked with all my 2.3 plugins straight up!